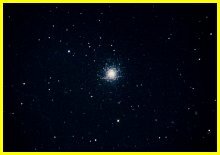 The globular cluster known as M13 is found in Hercules and is the finest in the northern sky. 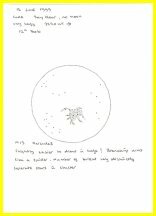 It is thought to contain several hundred thousand stars. 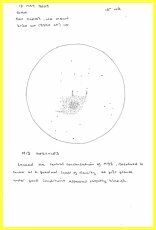 Although it is number 13 on Charles Messier's list, this and many other objects were not discovered by him. It was discovered by Edmond Halley, actually not long before Messier's birth. Both visually and photographically, the outlying stars of M13 resemble a very short legged spider. To the right of a triangle of stars at bottom right of the photograph is the tiny 11.6 magnitude galaxy NGC6207.